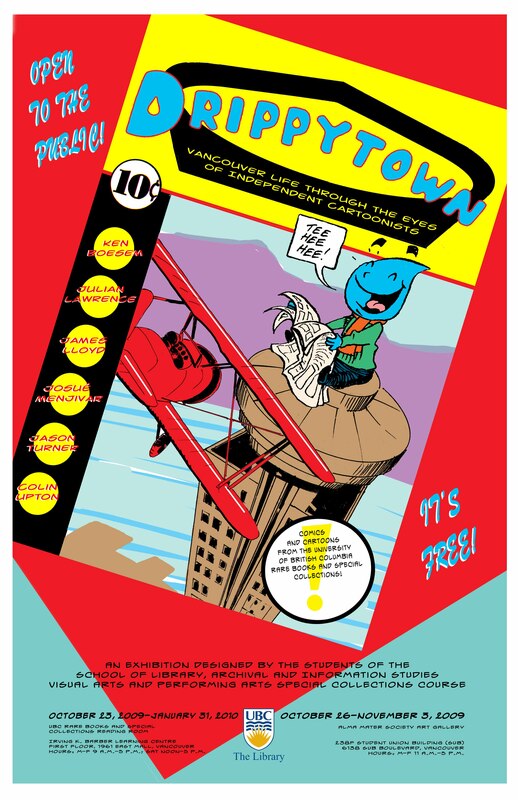 DRIPPYTOWN: VANCOUVER LIFE THROUGH THE EYES OF INDEPENDENT CARTOONISTS–Selected Comics and Cartoons from UBC Rare Books and Special Collections, designed by the students of the UBC SLAIS “Visual Arts and Performing Arts Special Collections” course. UBC School of Library, Archival and Information Studies, Suite 470, Irving K. Barber Learning Centre, 1961 East Mall, Vancouver. Opening Hours: Monday to Friday, 10 a.m.-5 p.m.; Saturday, 12 noon-5 p.m. Closed on Sundays and Holidays; special hours over Christmas Break. When accessing UBC Rare Books and Special Collections, please check bags and coats at the entrance.